Literally seven drops of rain fell on the car while we skirted the edge of this monstrosity, and while severe wind made it a little scary to drive, we did fine. We crossed the border like it wasn’t even there- there was an odd flinch from the border guard at the words "spinning retreat" but he waved us on without anything more. We bopped along to a fantastic soundtrack (courtesy of both our ipods and the fact that we were both 16 at about the same time) and when it got dark Rachel took the wheel and I knit. Gripping, I know. 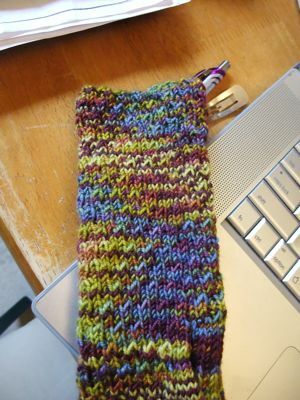 Just a little plain sock start, something I don’t need to be able to see to knit. (Someone will ask, so the yarn is a STR rare gem, one of a kind colour.) 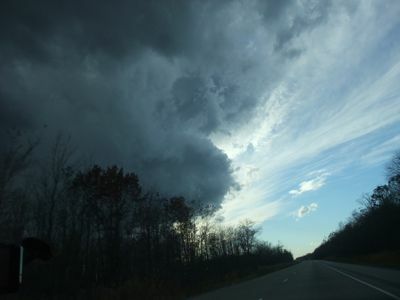 We blew along, guided by Daniel the GPS, until we quit driving last night in the bustling metropolis of Paw Paw Michigan. We ate dinner in the only place we could find that wasn’t a fast food place, had something really disappointing called a "Bosco stick" that sounded good but turned out to be deep fried- then screened three hotel/motels, chose the least bates-esque" and went to sleep. This entry is brought to you by the fact that last night, lying in the hotel room in Paw Paw Michigan, thinking about when to set our alarms, Rachel H and did some mediocre thinking. If we get up at 7:30, we thought, and boogie out the door by 8:30 we can be in the fine city of Chicago by 10:30. That would give us time to visit some yarn some nice people, have lunch and then, with almost no effort at all, we could strike out from the city about 12ish, and still be at SOAR by 3:00 like we’re supposed to. Perfect, we thought, and the plan was struck. We were both pretty crazy tired, and it was a little late, and both of us wished that there was another hour or two of sleep in there, but what can you do. Time is what it is. We set the alarm for 7:30. The night passed (in our insanely overheated hotel room with the window screen that is actually a magical forcefield that won’t let cool fresh air in) and when we woke up at 7:30 it hit both of us simultaneously. We’re crossing a time zone line. We start driving here in Eastern time, and pretty quick, before Chicago for sure, whammo. Central time hits you like a large wet fish and it’s an hour earlier. We could totally have slept another hour. That’s the sort of thing a GPS should tell you. I’m not packed, I’m not ready, but somewhere in the ramped up kerfluffle of yesterday I just thought "Screw it." I’ve decided to just leave, and I think that will go well. I have a passport, a spinning wheel and when I get off the computer just now I’m going to take some clothes, toss a few of them on my body and the rest in a suitcase and walk out the door. I’m stopping at the bank on my way, and I feel like anything else can be solved somehow. Family disaster meant that I missed last SOAR and this one is supposed to be fun- and sort of a break and the intention when we decided I should go, was for me to enjoy it. It’s been a hard year and I think I’m a little out of practice, but I’m going to try and stick with that. This colourway is one I thought I disliked and ended up loving. I got it because besides my self imposed sock club, I’m still a member of the Rockin’ Sock Club. I love the element of surprise in a fibre club. If I don’t like it, someone will, and because I knit for other people it’s always going to work out. 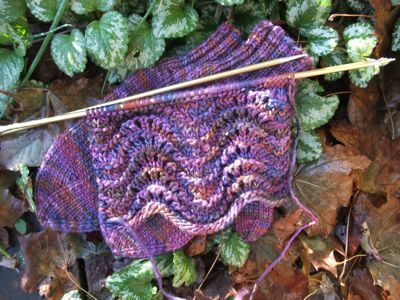 As I started knitting, the charms of the colourway started to amuse me- and it didn’t take long before I was knitting my size. 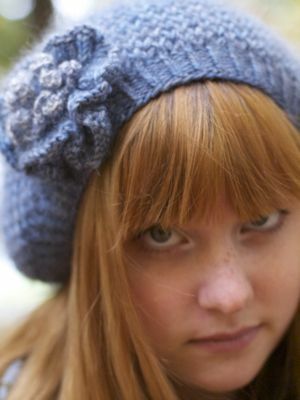 The pattern was quick and fun, easy to memorize and does make a charming little anemone-like pattern. I’m still thoroughly enchanted by my self-imposed sock club, especially since I’m getting closer to the end of the year and closer to 12 whole pairs of socks. Some have been for me, some for my long range planning box, but they’ve all been tucked away so that at the end of the year I can look at them all together when I’m done. Two pairs left! The next pair won’t be started till Monday, so now I find myself in a conundrum. What to knit until then? Do I need anything other than the shawl, if I’ll be at SOAR? I think I’ll mostly be spinning, but the shawl isn’t really social knitting (It demands a little focus) and I can’t remember the last time that I went anywhere without social knitting… but on the other hand, I am leaving very, very shortly and I’m nowhere near clad or ready – and going into the stash now seems like a fools game -as does setting up the ball winder. Leave without? Grab and go? Stop and consider? The sense of calm I had yesterday about my ability to get all my work done, the house ready and my materials gathered up before I leave for SOAR has evaporated entirely- which really, now that I think about it, is far more sane. I have no idea why I wasn’t worried. None. I lay in bed this morning, calm and sorted, and began to make my little mental list of all that I need to do today, and at first it was okay. 1. 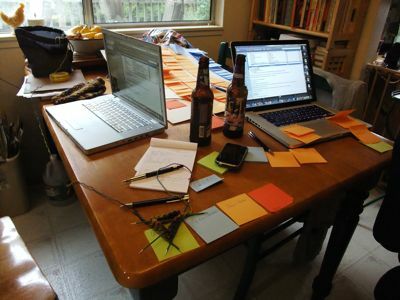 Write my wordcount for today. I have a book deadline looming. I’m slightly wound up about it. There’s nothing to worry about yet, but I have to meet my wordcount every day or the world will explode. Simple. That will take a few hours, but I can handle it, it’s my job. 2. Blog. That’s not so hard, only takes an hour or two. Look. It’s getting done right now. 3. 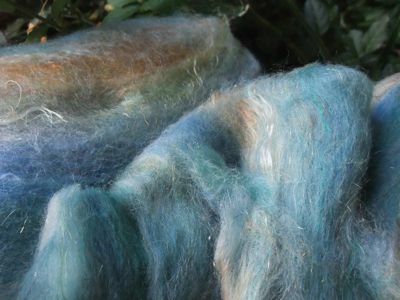 Go onto the SOAR website and find out what materials I need for the classes, then pack them up, hoping the whole time that the fact that this place is practically a shrine to the fibre arts means that I have everything I need. 4. Spend a few hours working on Sock Summit, reviewing text, making decisions with Tina, reading email. It was number five that pushed the first panicky thoughts foremost in my brain. 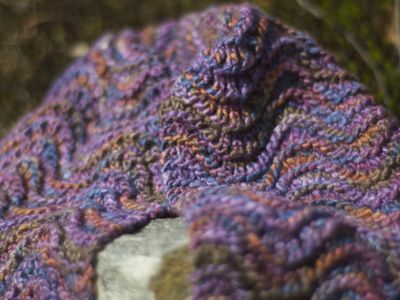 The minute I realized that at best, at my most efficient, caffeinated and moving like a seasoned knitter at a yarn sale, I was still looking at seven hours of work before breakfast – that’s when I started being able to hear the blood rushing in my ears. I modified breakfast to lunch and kept going. 6. Leave for meeting that I can’t change at 12:50. Do the meeting from 1:30-2:30, leave for home, taking the car with me. 7. Shop for groceries so that the family doesn’t starve while I’m gone. 8. Wonder if I shouldn’t really expect a full grown man and a 19 year old girl to be able to pick up groceries so they don’t starve by themselves. 9. Scratch #7 off the list, and realize that it’s misplaced maternal guilt because I feel badly that I’m going away for the weekend. Feel like crap about it anyway, and contemplate just getting "some" groceries. 10. Remember that the last time Joe went away, he didn’t grocery shop for me before he left. 11. 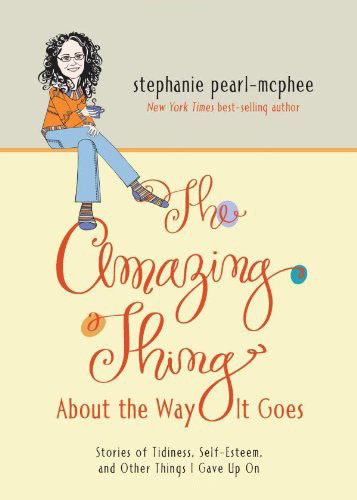 Fill with feminist rage, wonder when equality is really going to show up anywhere in the world, briefly reflect on the statistic that women in developed countries work (on average) 70 hours a week, compared to 51 hours (on average) for men, once you include things like going to the grocery store. 12. Consider the argument that I am perpetrating the inequalities in domestic labour division by going to the grocery store, and that this may be less than faithful and decent to the concept of equality I am ultimately hoping will prevail in my lifetime. 13. Decide to skip the grocery store, only because it is the right thing to do. 14. Run several errands and book several appointments that have to be done before I leave or bad things will happen. 15. At some point before I go to bed, speak with my children and express concern, love and interest in their lives for at least 5 minutes each. 16. Go to the post office and mail some important papers that I have inexplicably procrastinated on until the moment when they would cause me the most stress possible. 17. Do laundry so that I don’t go to SOAR in clothes that are a) dirty b) out of season or c) mismatched. 20. Print directions, hotel info, SOAR confirmation stuff, find my passport and make sure that I find Daniel the GPS and all his cables and put him in the car. (I’m pretty paralyzed without Daniel. Of all the modern conveniences I own, my coffee maker and Daniel are the two best. It’s like a talking map. Bloody genius, that’s what it is. 21. Wonder if getting this all done before tomorrow is really possible, or if I’m deeply deluded again and I should just give up now. 22. Spend 25 minutes I’ll never get back trying to figure out what is on that list that actually doesn’t need to be done in a futile attempt to earn back a free hour to watch Glee tonight. 23. Resist the urge to defend watching Glee. I like it. I don’t know why. I know there are some feminist/ability/disability/racial issues around it and I think about them a lot, but I end up sucked in every time anyway. It’s like my love for Prince and Richard Chamberlain. (I blame the Thorn Birds) It is completely unfettered by any reality about them that may surface. I’m not proud. 25. Look longingly at my knitting, and reflect that one of the wonderful things about it is that even when your life is mayhem, it is still possible to see forward movement in that work. Sure, I only got 4 rows done last night, and I’m not likely to see much better today, but that’s 4 rows closer to finished and nobody can take that away from me, even if my pants are stapled together and my inbox isn’t cleared before I leave. Knitting is the only work I can think of where getting a little bit done is totally good enough. 26. I love that, especially considering that it’s 12:40 and almost nothing on that list is done. I hope it all matters less than I think. I tried to smack the random off this Monday with several large cups of coffee, but the random remains and will therefore be embraced. 1. There are only a few days left until I leave for SOAR. I am not ready. Rachel H and I will be road tripping it – and I know I shall see my beloved Rams when I arrive, but other than that I’ve done nothing. No map, no fibre packed, no budget settled on, no wheel or tools sorted out. I haven’t even checked the website to see what materials I need to bring with me. 2. Despite this complete lack of planning, I’m not even a little worried. 3. This is the upside of having your life be like trying to nail jello to a tree. After a while you really learn to go with the flow a little. 4. Turns out that I didn’t just knit one sock a medium and one sock a small. In attempting to duplicate the first sock, it turns out that I knit a medium leg and a small foot on the first sock, and now that I realize how badly I screwed up, it’s easier to duplicate. 5. The irony that I advocate circling the directions for the size you’re knitting to all of my students to make sure that this never happens is not at all lost on me. 6. Even though it was a mistake, it actually fits great. I’m going to avoid saying anything like "I should easily finish by the end of the month" since I’m pretty sure that’s what sewered me before. 7. Four things conspired against me while I was at Tina’s last week, and when the haze cleared, I had accidentally started Laminaria. 8. Thing the first was that having to rip back a sock that far really, really pissed me off. I know it’s only knitting and all that, but from time to time I get supremely angry that being an experienced knitter doesn’t protect you from being a dumbass. If I’d have been paying more attention instead of just zooming along I would have seen it way sooner. I’ve said it before, I’ll say it again. Experienced knitters don’t make fewer mistakes than new knitters. They make bigger ones faster. 9. My point is that the sock filled me with rage and so I put it in time out, and that meant I had nothing to knit. 10. 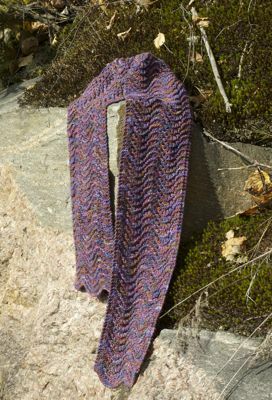 The second thing is that the Laminaria shawl has been haunting me something unmerciful ever since I saw the one that Natalie knit. I just love that pattern. I plan to knit it about six times a month. It was really only a matter of time. 11. The third thing that messed me up was that Tina is Blue Moon Fiber Arts Tina, and if you’re in her house than there’s a lot of yarn. Yarn is everywhere. All kinds of it. In all kinds of colours. Some of it is even wound up, and if the house wasn’t overwhelming, then there’s the dye barn out back and it’s got the motherlode in there. 12. The fourth thing is that once you get her to unlock the door, Tina has really low security. There’s yarn in her bedroom, and she let me sleep in there. 13. She knows how I am with yarn. Putting me in that house was like asking a frat house to keep an eye on your keg. 14. This is mine now. Silk Thread II in pondscum. I’m not sorry either. 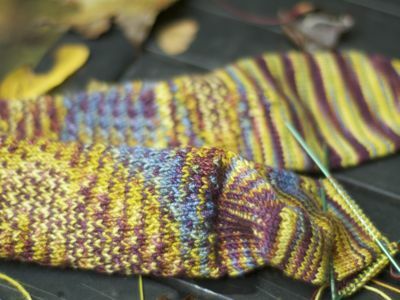 No sooner had I written yesterdays blog post, effortlessly exclaiming that I would "easily" finish my sock before the end of the month, than I noticed that the second sock was really different from the first. The first sock was pooling prettily on the leg (I usually have issues, but this colourway is "tidepooling" so it only seems fair) and the second sock was striping. That was weird. There’s really only three reasons the same yarn could do two different things. Either I had a different stitch pattern, (Nope. Would have noticed that, I should think) or I had a different gauge (I would say not for this as well. 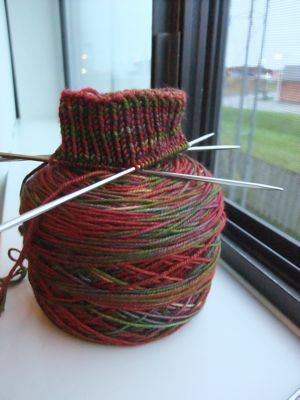 Same yarn, needles, stress and alcohol levels) or I had a different number of stitches. (This is what Sock Summit prep looks like. Fear us. We are the reason that Post-it notes are in business. Our entire conference is built on them. 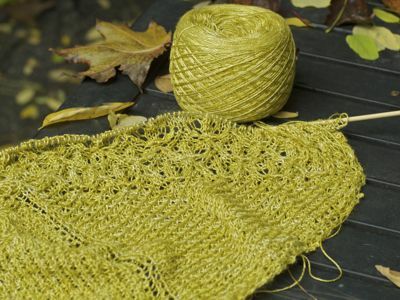 Other people have software, we have sticky-ware) I fear for it’s completion by the end of the month, poor wee blighter – especially since I accidentally slipped and fell last night, and when I came up I had started a shawl. I fly home early tomorrow, but have a long layover in Vancouver. I’ll tell you all about it then. It’s a nice shawl. I think you’ll like it. 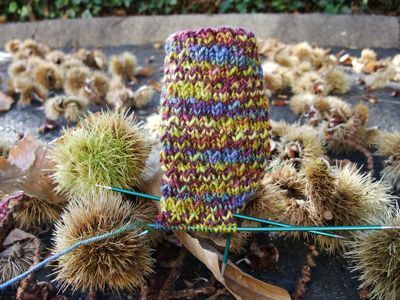 My poor little October self-imposed-sock-of-the-month club sock has been neglected, not in the knitting, but in the reporting. Allow me then, to take just a moment to introduce you. 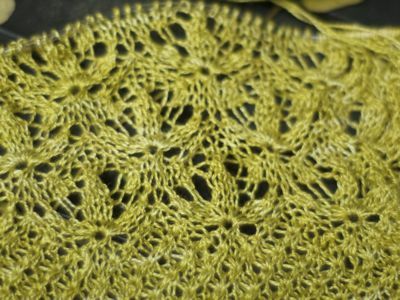 This is the second of a pair – I think I’ll easily finish by the end of the month. 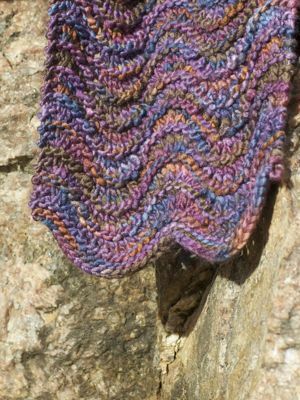 Yarn: STR lightweight in Tidepooling, and the pattern is "Cloning anemone". I’m rather fetched with them, as well as the patch of fallen horse chestnuts I found to photograph them in. (Hint: don’t try to rearrange those things. They’re pokey.) The pattern is way cooler than it looks here, but my ability to arrange the sock to show the pattern up amongst spikes in a parking lot was limited. I’ll show them off better tomorrow when they’re in a less tricky location. This all comes to you at a very wee hour, though I’m starting it at home before I leave, it will likely be finished at the airport. Here are things I’m thinking this Monday morning- and before you start correcting me, stop right there. It’s Monday if I say it is. The real day following Sunday was a complete piece of complicated arse that I absolutely could have done better, and I would have skipped it, were it legal. I’m calling a do-over. Reasons why, and yup. It’s a little random. 2. The fact that Sam is far, far north of here has me in such a tizzy that all I can do is knit for her over and over. The last week has produced a hat and mittens, and now a scarf, since I’m worried she’ll be cold without her mum. I know that almost 17, kids really aren’t cold without their mums, but I can pretend and dream. This scarf is just a simple feather and fan, and is the leftovers from the mittens I made her the other day. It’s LSS in Eggplanted, and wonderful soft. Mostly knit in a car, and blocked in a hotel room. 3. I am fighting the urge to knit her everything. Like maybe pants or a snowsuit, but realizing that this is like the urge I had to microchip Amanda before she went to Europe. 4. She has actually asked me not to be weird with the knitting. 5. I don’t know if I can’t be not weird about the knitting thing. 6. I’m flying to Portland today to work on Sock Summit. 7. We came back from up north last night sort of late, and I had to unpack my stuff, wash my stuff, and repack my stuff and get to the airport by 5:30 and that’s a totally crazy time of day and I really, really think that I have to do something about how crazy I am if I think that I can do this trip on 4 hours of sleep, but here I am again. 8. 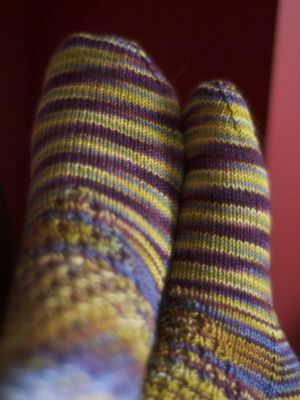 I am in the airport now, and I am knitting socks and blogging to stay awake. 9. I would sleep because I’m really not that hung up on being awake at this time, but I’m actually very worried I’ll miss my flight if I nod off. 10. I think I may need to examine the level of self loathing that let’s a woman get herself out the door this early just to save money, because that’s what it was. I’m here this early because the later flight cost way more, and I can’t bring myself to pay $100 an hour for sleep, and despite being a staggering zombie in the airport right now, I don’t see that changing about me anytime soon. 11. Even if I could afford it, I think I would rather spend $100 on yarn than sleep. 1. I am sort of cold. It’s in the single digits outside- the furnace wars are in full swing. 3. Erin called yesterday and asked if the heat was on yet. She sounded hopeful. I crushed her. She crushed me back. We re-affirmed the rules, if it’s November 1st, the heat goes on, or if it snows, the heat goes on – with no winner or loser. 5. It is really cold in here, but I love starting the winter this way. 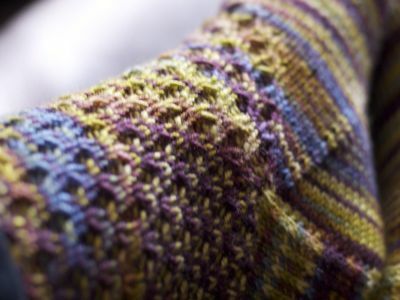 I think it acclimatizes everyone and as a knitter, I love how valuable it makes everything I’ve knit. People LOVE their sweaters if you don’t turn on the heat until it’s truly cold. Love and wear them. Mittens for Sam. 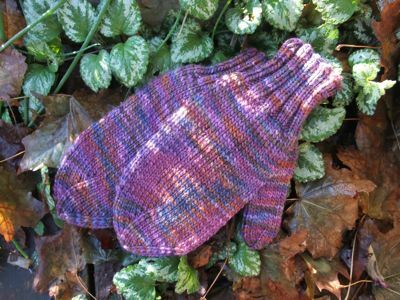 It’s just my basic in my head mitten pattern, but I tried a new top this time because Sam likes things swirly. The yarn is LSS in eggplanted, and there’s a matching scarf in the works that needs to be finished on Monday- and I’ll tell you why another time. 7. I spent too much time last night choosing a pattern, and now I’m already behind on the scarf. 8. The irony is that this is the same pattern (Feather and fan) that I cast on in the first place, before ripping it out and trying nine others and eventually returning to the one that I liked in the first place. I have got to learn to trust my knitting instincts. 9. Today, like yesterday, is a day of a thousand errands. I’m taking the scarf with me, and hoping for the best. There’s got to be a way to pound it out by Monday. If you were here, you would absolutely feel winter looming around at you while you were out and about. There are sure signs that the deep, dark cold is almost here. In the morning now I always put on a sweater, and the afghans in the living room are forever heaped on the chesterfield. Fetching the paper this morning I could see my breath, and after having been fantastical all summer, the morning glories are gasping along in the desperate last days before the frost gets them. Leaves crunch under my feet when I’m out, and pumpkins and squashes overflow at market stalls. I have thought seriously about turning on the furnace at least twice, though it’s often in the back of my mind now. (I’m waiting though. I don’t want to be the first to fold- it was only 3 degrees out this morning though, if it hits zero or snows I’m out of the game.) It’s dark by suppertime, soup is all I want to make, and the surest sign is right here on the blog. Mittens, hats, scarves…. 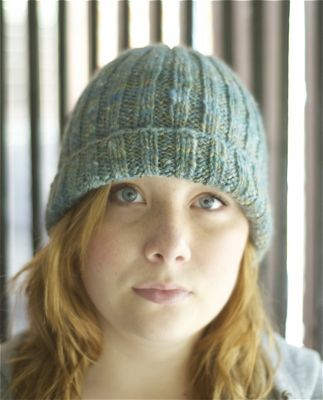 all I want to knit is quick little winter insurance policies that my family will be warm. After Meg got her hat, Samantha bellied up to the bar. We spent a good long time looking at hats. 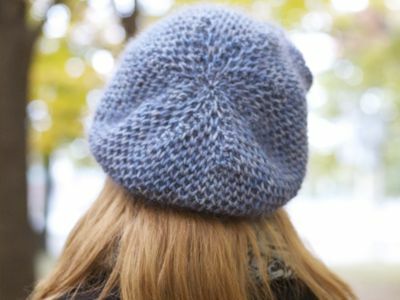 Cabled hats, cute berets, hats with colourwork, hats with lace, hats with brims- and after all of that, Samantha said that really, she just wanted a plain good hat, with ribbing and a part that folds up to be cozy over her ears. The only catch? Blue. It should be blue and soft, and maybe sparkly, but not too sparkly. She’s sixteen. The degree of sparkle is pretty sharply defined. I poked through the stash and didn’t find the right yarn, but did spot perfect fibre. 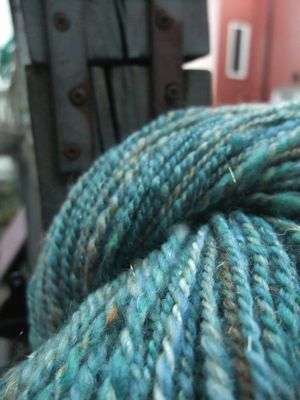 I had two batts of "natural turquoise" from Enchanted Knoll Farm (I love her batts. It’s a disease. They’re full of all sorts of wool/silk/recycled sari silk/sparkles and you wouldn’t think that I would love them, but I do. It might be the sari silk. Every time I come across a little bit of it I’m thrilled, watching those threads incorporate into the yarn is really, really exciting. (That makes me sound like I’m also interested in watching paint dry, but I swear it’s cool.) I should play around with it and try to get it out of my system. Darn Good Yarn (fair trade, neat project, have a look) donated some yarn to the silk retreat the last go around, and Judith MacKenzie showed me how to unspin then respin it to get more choices and it’s very, very, very cool. 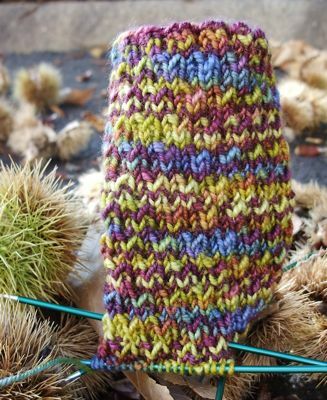 I’d never thought of the balls of yarn not just as yarn, but a fibre source, but it works. See? Obsessed.) I found these batts, sat down to spin, and in no time flat had a perfect two-ply hat yarn that passed Sam’s strict quality/coolness control standards. From there it was a simple thing. Two by two rib, knit long enough to cover her ears double, using up every scrap of wool. The hat got a little wash, and was neatly placed on the head of the nearest hatless pretty girl who was starting to look a little cold. It reminds me of frost, and the deepest, coldest winter, when the sky is so blue and the snow is so sparkly…. I better make some mittens. Apparently those should be purple. 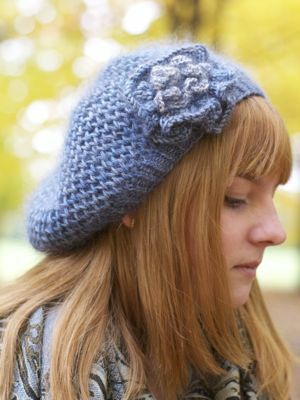 Megan’s beautiful new hat, the Sweet Honey Beret from Interweave Winter 2008. Tosh Dk in Mourning Dove, and Schulana Kid-Seta held together. Meg hasn’t taken it off, and really? Why would you. That’s one fine hat.